Hey, Oracle 18c is now available on the cloud and for engineered systems! For more than a week now. That also means you can play with it at LiveSQL. And of course you can try polymorphic table functions (PTF)! At least I’ve done that this weekend 😉 And here is my first working example. Let’s start coding. 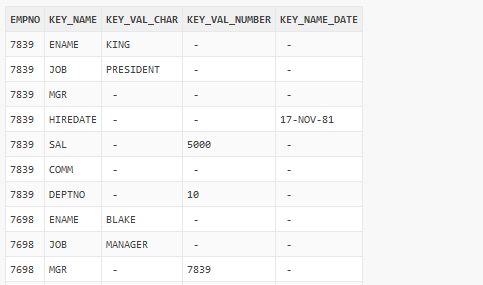 We’ll create a function TAB2KEYVAL which will accept the table and a list of ID-columns as parameter. The implementation of a polymorphic table function resides in a package. We must provide the function DESCRIBE which will be invoked during SQL cursor compilation and describes the shape of the returned result set. This function accepts the record type TABLE_T, a collection of columns COLUMNS_T and returns a recod type DESCRIBE_T. During the execution stage the rows are processed inside of the function FETCH_ROWS. That’s what we need for now and we can start the implementation of a package body. In the function DESCRIBE we are looping through all columns or the source table and mark them not to be passed through, unless this is the specified ID-column (lines 9 to 19). We also specify that all columns have to be processed during fetch phase (for_read = true). Again, unless it is an ID-column. Next we specify four new columns to hold the key name along with three possible key values (lines 22 to 29). That’s it. We just need to return a record DESCRIBE_T containing the information about new columns. Another point here: we are going to replicate the source rows, because we’ll get one row per transposed column (line 32). Now we are ready to look at the processing itself – procedure FETCH_ROWS. Using procedure GET_ROW_SET (line 48), we get an input rowset with column values of the columns, which we had marked as FOR_READ. 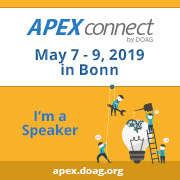 The returned datatype is a table or a record type COLUMN_DATA, which in turn has so called “variant fields” – a tables for every supported datatype, e.g. tab_varchar2, tab_number and so on. Only one variant field corresponding to the actual datatype is active for a column. Every row in a rowset has it’s own replication factor. We set it initially to 0 (lines 50 to 52). 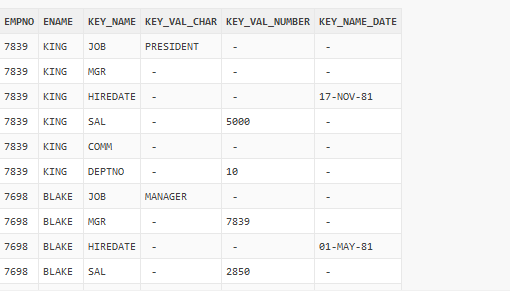 Then we loop through all rows and columns increasing the replication factor and filling the tables which hold the data for key_name and key_values with actual data. These tables – one for the key name (NAMECOL) and three for key values (VALCHARCOL, VALNUMCOL, VALDATECOL) – are defined at lines 43 to 46. The processing actually differs only slightly because of the different data types. Next we specify the replication and pass the prepared collection for new columns back – the calls of PUT_COL at lines 78 to 82. The package is there, so just define the function using it and it works! Dynamic Pivot with Polymorphic Table Function? This entry was posted in 18c, General, PTF, SQL, Trivadis and tagged "polymorphic table function", PIVOT, PTF, UNPIVOT on 26. February 2018 by admin. so that a developer can have a good comprehension of the principles, before getting into the details.